On a trek to deliver a cache of gold to an unspecified location populated by the sick and needy, a group of escorts proficient in martial arts are hired to protect the shipment. With assorted dangers at every turn, the dreaded Chi Sa gang, led by Golden Arm, intercept the heroes with a series of ambushes and traps in an attempt to take the gold for themselves. 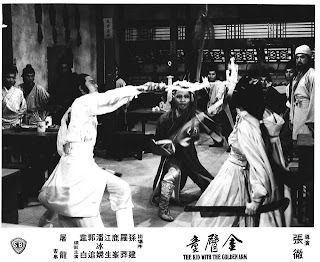 The Godfather of Hong Kong action cinema delivers this inferior, yet popular Wuxia/Kung Fu hybrid in his fan named venom series that featured Cheh's last notable team of martial arts cinema performers. While KID WITH THE GOLDEN ARM is a favorite among fans, it rarely gets a spin in my DVD player. 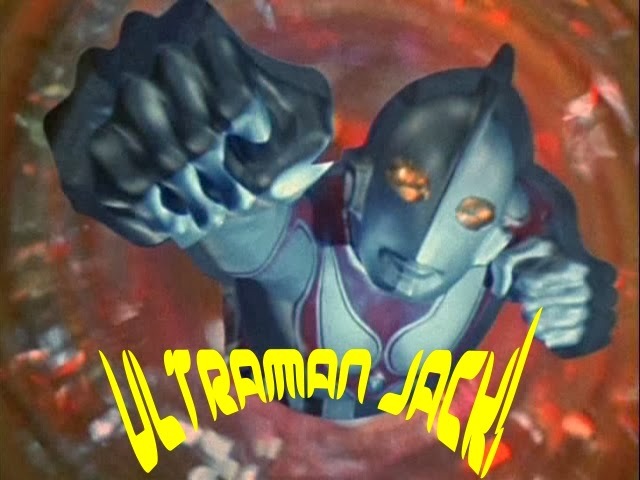 For years it was only available in a seriously compromised version edited for television. The HK DVD released in 2006 truly showed off the vibrant colors inherent in the movie. This slapdash effort does have a few things in its favor that will endear it to fans both new and old. 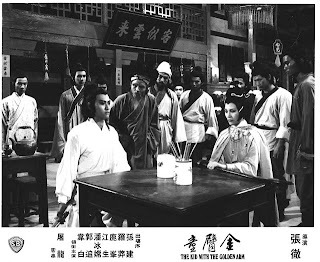 The production is probably Chang Cheh's most successful attempt at capturing the look and feel of a live action comic book. Everyone from the good guys to the bad guys have their own signature color scheme. Their costumes and weapons of choice are just as flamboyant. The main problem with the movie is that it's a static affair that suffers from being shot on cramped sets. 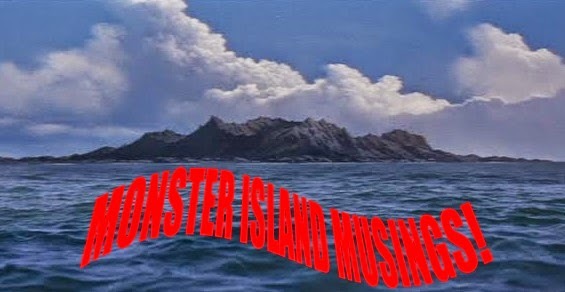 The film is edited in such a way that it appears the characters move a few feet before having to exit one studio bound shed and enter another one. There are a couple of exterior shots and one of the enormous outdoor Shaw sets are seen at least once, but the low budget is painfully obvious. Even still, this doesn't hinder the films popularity with fans. Incidentally, the US version features different editing in one scene when compared with the HK version of the film. The scene in question occurs during the fight with Brass Head. A Chi Sa thug rushes in and yells that Iron Robe has sent up a flare right after the wagon carrying the large gold shipment he's hijacked has thrown a wheel. In the HK cut, the thug runs in before we see Iron Robe shoot off the flare. It insinuates that Iron Robe has used more than one flare and the reason no one has answered his distress call is that the gang are busy engaged in a fight with the martial escorts. Lo Mang plays the leader of the Chi Sa gang. Named Golden Arm because his arms are invulnerable to sword strikes, the rest of his body is unable to withstand such attacks. Despite being the villain, this is Lo's showcase. 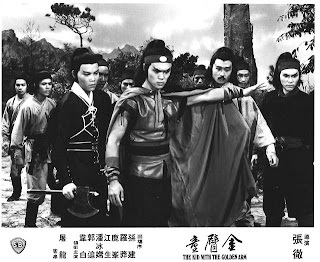 When Chang Cheh began shooting movies with this new troupe of actors, the plan was to give each one a chance to shine. But like the directors prior super group movies, it's difficult to give any one actor the floor when there's several others vying for some screen time. Nonetheless, some actors get more time than others. Lo Mang has a good amount of charisma and here, he plays the lead antagonist in an arrogantly restrained fashion. In most of his movies, whether directed by Cheh or another filmmaker, Lo plays his characters as an overanxious hot head who seldom thinks before he acts. 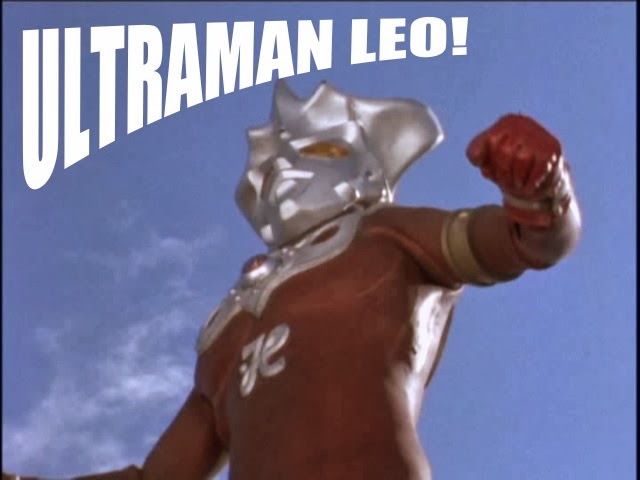 Once the venoms parted ways when Chang's style of film was slowly withering away, Lo Mang managed to get an occasional solo vehicle such as his star turn in LION VS. LION (1980) and 1985's PURSUIT OF A KILLER. Lo also got some prominent supporting roles in such worthy, but extremely violent movies like FIVE ELEMENT NINJAS (1982) and SECRET SERVICE OF THE IMPERIAL COURT (1984). Lo also was a lively presence in a co-starring role alongside Ti Lung in CLAN FEUDS (1982), based on a popular Chinese novel. Kuo Chui plays the drunken secret agent, Hai To (spelled like toe). 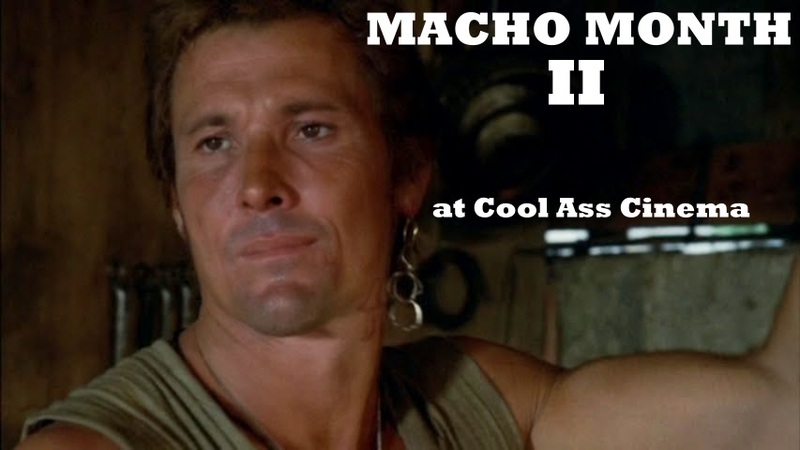 Throughout the film he's seen carrying around jugs of wine of various sizes. He's usually one step ahead of everyone and keeps the good guys from harm on several instances. His character is something of a Bond type hero without all the gadgets and snappy clothing. As with most of the movies starring Kuo, he is generally the most level headed of the group although on a couple of occasions he is something of a buffoon. Such is the case with Kuo's characters in both SHAOLIN RESCUERS and THE DAREDEVILS (both 1979). In those films, Sun Chien is the most focused of the bunch. Lu Feng is as he always is, a villain. He may have played a good guy here and there, but his strength was as a bad guy. He had one of the most sinister visages of any Shaw Brothers actor, or any actor from Asia for that matter. He almost always played a menacingly wealthy, educated scholar with a cunning agenda. But sometimes, like here, he played a colorful, guileful, yet straightforward villain. Lu plays Silver Spear, the second chief of the Chi Sa gang who wields a retractable spear and brandishes an assortment of shorter dart weapons on his belt. 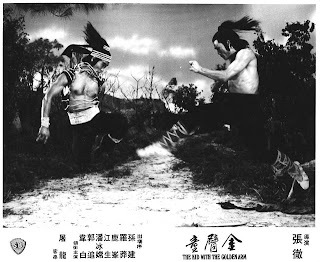 The fight sequence between childhood friends, Lu Feng and Chiang Sheng is the films highlight and a wonderful piece of choreography. Chiang Sheng plays Short Axe, the partner to Long Axe, played by Sun Shu Pei. Both individuals argue over who gets to kill the most enemies. As usual in most all of his roles, Chiang Sheng plays a rowdy, but playfully impish character akin to what Fu Sheng was known to play. However, Chiang Sheng did play a few serious roles from time to time. 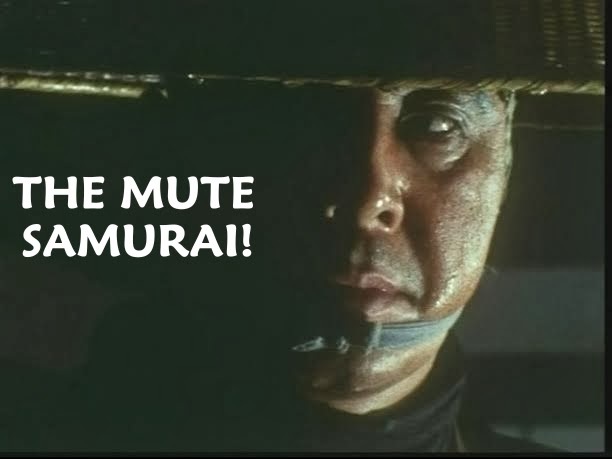 He was a villain in THE LEGEND OF THE FOX (1979) and THE SWORD STAINED WITH ROYAL BLOOD (1981) and a righteous swordsman in MASKED AVENGERS (1981). 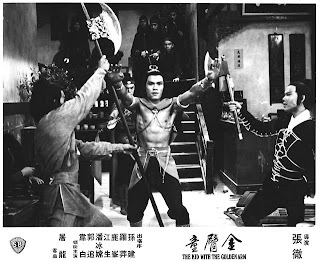 Considering he, Kuo, Lu Feng and a handful of other later Chang Cheh performers were all from the same school growing up, it was just natural that the three main venoms worked the best together. 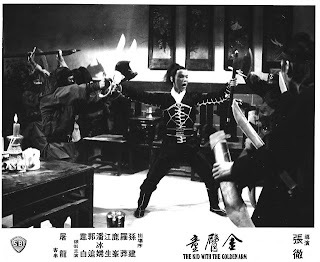 Sun Chien plays a dual role for this entry and although he is featured flagrantly on the promotional materials for the film, he isn't showcased much at all until the end when the real antagonist of the movie rears his ugly head. Sun Chien seldom got a chance to shine in the movies in which he was cast. He was appearing in good roles before the other venom performers got their own lead roles, but he seemingly never caught on like some of the others did. His role in CHINATOWN KID (1977) is one of his best. He was actually the lead in INVINCIBLE SHAOLIN (1978), but his inert performance assured he would be overshadowed by everyone else. However, Sun Chien could grab your attention when his kicks were being showcased on the screen. Wei Pai plays the arrogant swordsman Li Qing Ming. His character is so stubborn and laughably stoic, I can't help but wonder if Cheh didn't intentionally try to parody his own style of chivalrous swordsman from his past repertoire. Wei Pai was the Snake in FIVE VENOMS (1978), but he never got along with the other actors. 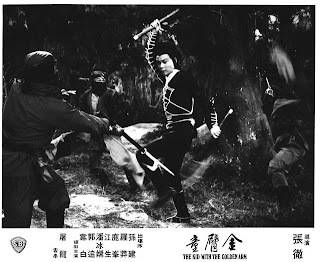 Growing disenchanted with his career, Wei left Shaw Brothers in 1978 whilst shooting TEN TIGERS FROM KWANG TUNG (1978-1980). His career went nowhere, but he did get a few films under his belt such as LAST HURRAH FOR CHIVALRY (1979) for John Woo, a supporting role in Jackie Chan's YOUNG MASTER (1980), his one lead role in a kung fu comedy entitled THE CHEEKY CHAP (1980) and a horror kung fu flick, THE PHANTOM KILLER (1981). While the choreography isn't the strongest of the series, it has its moments such as the aforementioned duel between Short Axe (Chiang) and Silver Spear (Lu). 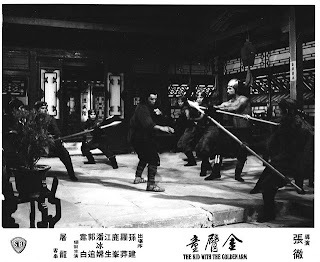 Many of the scenes featuring Golden Arm showing off his skills are impressive such as one scene where he stabs a man with his own sword and twists the blade into a spiral formation before ripping the swordsman's intestines from his stomach. Another scene has Golden Arm shatter a big bladed broadsword into little pieces. The one on one fight between Hai To (Kuo) and Iron Feet (Sun Chien) during the closing moments is a fast paced piece of action design. With all the flack the director has gotten over the years for his use of women in his films (it's all exaggerated in my opinion), the female swordswoman played by Pan Ping Chang does little throughout the movie to change the minds of those that say Cheh disliked women, or was a homosexual. However, her character proves integral to the plot in another way. She is the catalyst for the hatred Li Qing Ming feels for Hai To and she also figures into the final fight in an interesting way that is quite ironic in light of how people feel Cheh used women in his films. No doubt I am in the minority for my low opinion of KID WITH THE GOLDEN ARM. It's not that I don't like it, it's just that I feel it's one of the directors lesser, more sloppy productions. It has good points which I have discussed, but outside of that, it's difficult for me to recommend the film to anyone but those familiar with the venoms, or kung fu/wuxia movie diehards. 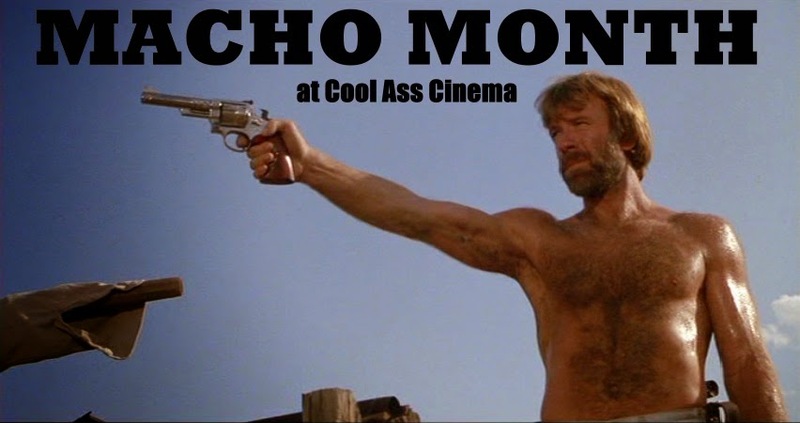 The menagerie of colorful superheroes and villains and the bloody violence may be enough to startle the curiosity of newbies, but for those who can appreciate Cheh's more respectable works, KID WITH THE GOLDEN ARM is one of the esteemed directors lower tier efforts, barely rising above mediocrity. This review is representative of the R3 IVL DVD from Hong Kong. 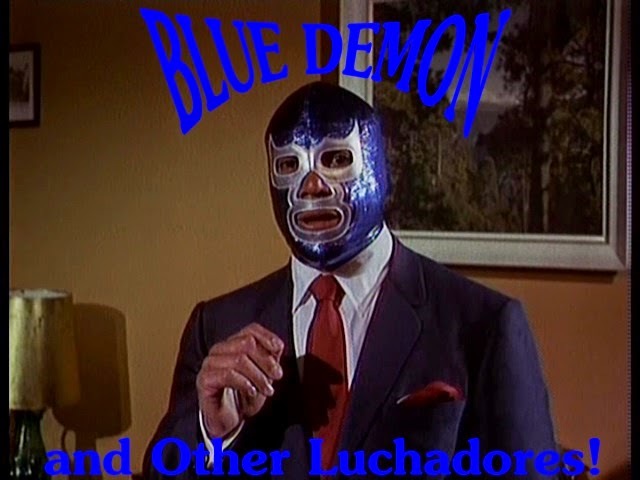 Media Blasters is set to release this film in December in the United States.